Myofascial Pain can occur anywhere through out the body muscles. Muscular pain is a major component of chronic pain. It can be associated with other painful conditions or can be present by itself. Myofascial Pain can lead to severe spasm and restrict day to day activities due to pain. Muscular injury- sports, gym, weight lifting etc. Bad posture- desk jobs,computer use, prolonged sitting, fine workers etc. Associated with other causes of back pain, neck pain, joint pain etc. 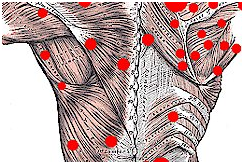 A Myofascial trigger point is a hyper irritable spot usually within a skeletal muscle and is painful on compression. It can give rise to referred pain, motor dysfunction and autonomic phenomenon. Trigger point injection with local anesthetic and corticosteroids.